Why do I continue to knit when I find it eternally frustrating?? I'm trying to knit Hugh a scarf. I love this wool so much, but I'm not loving trying to find an appropriate pattern for it. Hugh and I agreed that a simple (stockinette stitch) pattern would show off the wool best, but even after blocking the scarf on the left, it still curls up horribly (middle of the photo). Am I just being too picky? Probably. But I want my man to love it! Why is it that the only other person I know who is interested in sewing and knitting lives on the other side of the world? I just recently took up knitting and am trying to make a sweater (trying is the operative word there - we'll see how it goes). I like the scarf on the right! 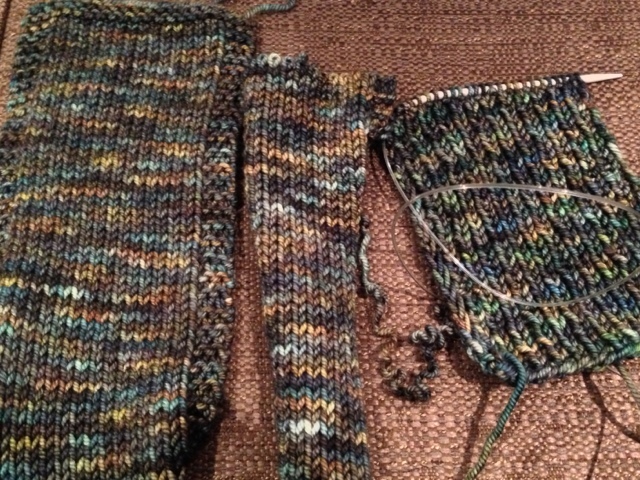 I think the ribbing looks nice.